« Blackrod is simplicity in itself. Last Friday I went to Ramsbottom in Lancashire to see the old train station which has steam trains visiting. All the smells of those times way back. 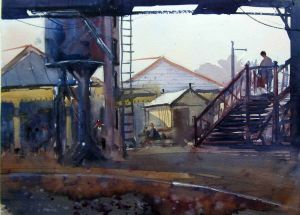 I saw the light on the little shed and realised that was a good starting point for my picture except I was standing on the level crossing when I saw it. There were no trains coming, but it was an impossibility to paint it from that position. I paint fast but not that fast – which leads me onto my painting tip. At least someone may consider it a tip anyway. I don’t paint fast in order to capture the light, which is constantly changing, I paint quickly because I am impatient and want to get to the finishing touches as soon as possible. It’s the final touches that either make or break my paintings. So I have to be careful, but I don’t need to be careful with my first washes because they won’t shine and sparkle and glow if I am. Well anyway, I quickly sketched the scene and then retired to the other side of the road to paint it. I wasn’t at the same angle but the colours and atmosphere were still there for me to see.